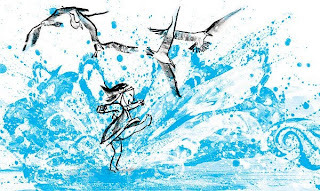 This weekend I "read" the wordless picture book Wave by Suzy Lee. I was recommended this book by my colleague at Sesame Street, Margot, who had thought I would be interested in it stylistically. Not only was I interested in the aesthetic beauty of the piece, I was struck by the amazingly universal sensory experience of interacting with water at the beach. The entire book was painted in a light blue and accentuated with the whimsical charcoal lines of the character. In terms of my project, I am very interested in creating a piece that can work on several levels. I feel that Wave achieved this by being both engaging to young readers and nostalgic for older ones. Additionally, this sensory experience is something that I feel is very important to pay attention to when you are speaking of environmental awareness issues. If people can feel connected to an issue, then that is the first step towards activism.